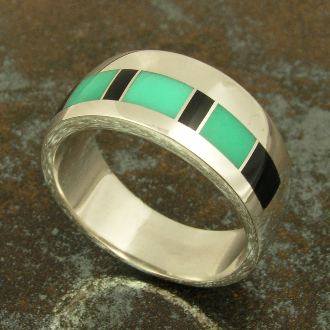 Handmade sterling silver ring inlaid with green chrysoprase and black onyx. The 3 pieces of translucent chrysoprase appear to "glow" when you hold the ring in the sunlight. The ring is about 10mm wide and is shown in a size 10+ or a snug 10 1/4. The ring has a fairly low profile and is very comfortable to wear. If you would like to wear this ring as a wedding band, a matching ring set could be made by special order. The last photo shows a popular choice for a coordinating white sapphire and chrysoprase woman's wedding ring. If green is not your thing, then other colored stones are also available by special order and can usually be completed in 4 to 6 weeks. If you are not familiar with chrysoprase, here is some information about the stone. Chrysoprase normally occurs as an apple green colored variety of chalcedony, commonly known as quartz. The chysoprase in this ring came from Australia, but chrysoprase can also be found in Brazil, the Ural Mountains, and the U.S. It is often mistaken for Imperial jadeite because of its similar green color. Chrysoprase is a 7 hardness on the Moh's scale, so it makes a good durable stone choice for rings.